Your entire existence... all matter, all life, all experiences - everything owes its existence in the physical world to frequency. Absolutely everything is frequency. You cannot have an experience on this planet without attracting it through frequency. Every emotion, including love and hate, tunes into a specific frequency. Health has a frequency. Disease has frequency. Your organs are each tuned to a specific frequency, as is your entire body, which resonates at its own frequency. You are a symphony of frequencies while you project yourself through this universe and create your physical reality. You are a master of your energy, and thus you are able to control everything you are, everything you do, everything you experience. From the day you are born until the day you die, nothing will ever change the fact that you are both a frequency emitter and receiver in flux with your internal and external environment. DNA possesses two structural characteristics of fractal antennas, electronic conduction and self symmetry; electrical conduction allows the movement of electrically charged particles within the body. The universe is more than 99.999% empty space, including our own bodies. 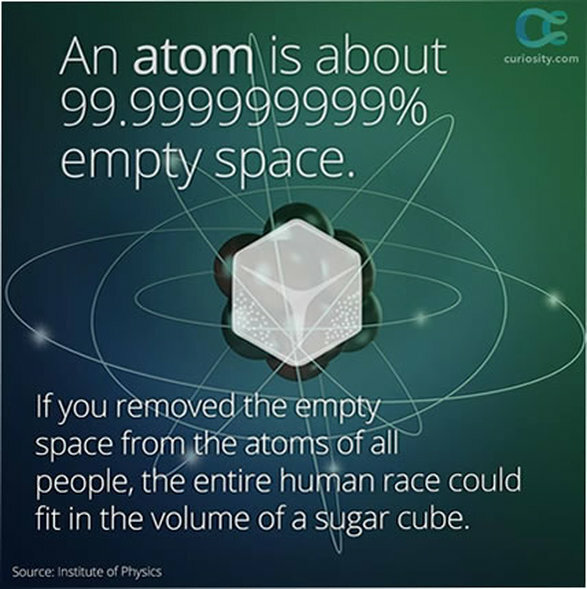 All physical things are made of atoms which are mostly empty space. If the nucleus was the size of a marble, the electrons would be specks of dust a half mile away. Every physical thing has that much empty space in it. Inside that 'empty space' is intelligence and frequency. The world and the universe around us are filled with sacred geometry and the golden ratio. From seashells to the human body, from the cosmos to the atom, all forms are permeated with the shapes found in sacred geometry. While sacred geometry theories can be verified mathematically, it is also a field which holds much interest to many different religious communities, who can find that it holds deep spiritual meaning for them. Scientists, archaeologists, mathematicians and many spiritual seekers study sacred geometry as well. The human genome is packed with at least four million gene switches that reside in bits of DNA that once were dismissed as "junk", but it turns out that so-called junk DNA plays critical roles in controlling how cells, organs and other tissues behave. The discovery, considered a major medical and scientific breakthrough, has enormous implications for human health and consciousness because many complex diseases appear to be caused by tiny changes in hundreds of gene switches. Chronic disease occurs when voltage drops below a certain level. Cells then don't have enough energy to work correctly and the amount of oxygen in cells drops, switching from aerobic (oxygen available) metabolism to anaerobic (oxygen diminished) metabolism. Because cell membranes are composed of di-electric materials a cell will behave as a di-electric resonator and will produce an evanescent electromagnetic field in the space around itself. This field does not radiate energy but is capable of interacting with similar systems. The applications of certain frequencies by frequency generating devices can enhance or interfere with cellular resonance and cellular metabolic and electrical functions. The changes in the degree that water is structured in a cell or in the ECM [extracellular matrix] will affect the configurations and liquid crystal properties of proteins, cell membranes, organelle membranes and DNA. Healthy tissues have more structured water than unhealthy tissues. Clinicians who recognize this fact have found that certain types of music, toning, chanting, tuning forks, singing bowls, magnetic waters, certain types of frequency generators, phototherapy treatments and homeopathic preparations can improve water structuring in the tissues, and health, when they are correctly utilized. The cells of the body are composed of matter. Matter itself is composed of atoms, which are mixtures of negatively charged electrons, positively charged protons and electrically neutral neutrons. When an electron is forced out of its orbit around the nucleus of an atom the electron's action is known as electricity. An electron, an atom, or a material with an excess of electrons, has a negative charge. 6. How techniques such as acupuncture, moxibustion [a traditional Chinese medicine therapy using moxa made from dried mugwort] and laser (photonic) acupuncture can result in healing effects and movement of Chi? 7. How body work such as deep tissue massage, rolfing, physical therapy, chiropractic, can promote healing? The Russian biophysicist and molecular biologist Pjotr Garjajev and his colleagues also explored the vibrational behavior of DNA. The bottom line was: “Living chromosomes function just like solitonic/holographic computers using the endogenous DNA laser radiation.” This means that they managed, for example, to modulate certain frequency patterns onto a laser ray and with it influenced the DNA frequency and thus the genetic information itself. Electric fields conventionally defined as strong thermally may be low in biological information content, and electric fields conventionally considered as thermally weak or non-ionizing may be high in biological information content, if the proper receiving equipment exists in biological tissues. Weak electromagnetic fields are: bio-energetic, bio-informational, non-ionizing and non-thermal, and exert measurable biological effects. Weak electromagnetic fields have effects on biological organisms, tissues and cells that are highly frequency specific, and the dose response curve is non linear. Because the effects of weak electromagnetic fields are non-linear, fields in the proper frequency and amplitude windows may produce large effects, which may be beneficial or harmful. Homeopathy is an example of a weak field with a beneficial electromagnetic effect. Examples of thermally weak, but high informational content fields of the right frequency range are visible light and healing touch. Biological tissues have electronic components that can receive, transduce, transmit weak electronic signals that are actually below thermal noise. Biological organisms use weak electromagnetic fields (electric and photonic [light]) to communicate with all parts of themselves An electric field can carry information through frequency and amplitude fluctuations. Healthy biological organisms have coherent biofields and unhealthy organisms have field disruptions and unintegrated signals. It is said that frequency, and thus vibration, is the variable of dependence. The genetic wave information from DNA, recorded within the polarizations of connected photons, being quantum-nonlocal, constitutes a broadband radio wave spectrum correlated by means of polarizations with the photons. There is at present on our planet a great schism in belief regarding resonant frequency. There are those who believe that, yes, we all vibrate to the same frequency, whether it is the vibrational rate of the energy points or the vibrational rate of the liver. And many of these are people who believe they have indeed figured out the vibrational rate of the various organs, other bodily parts and etheric fields, and have invented instruments, made tapes or created machines which will somehow project the correct resonant frequency back into the body to heal what ails you. Then there are others who believe that we are all unique vibratory beings; that the frequencies of our organs and bodily systems may be different and are not the same. One fact will always remain... we are all energy, bounded by frequency. How we interpret ourselves and our universe is guided by the one elusive concept that scientists still find mysterious, yet intriguing. Until that day comes when more research is devoted to how frequencies affect our entire existence, those mysteries will remain unsolved. Josh Richardson is a blogger, healer, and constant pursuer of the natural state of human consciousness.